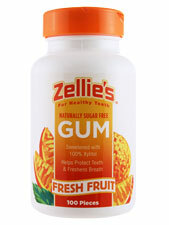 Enjoy Zellie's throughout the day for fresher breath and healthier teeth and gums. Frequent between-meal consumption of foods high in sugar and starches promotes tooth decay. The Xylitol in Zellie's Gum does not promote tooth decay. Warnings: Please keep Zellie's away from pets. Xylitol is not recommended for animals. Additional Info: Vegan. Produced in a facility that also processes Soy. Dentist recommended. Made with US Birch and Hardwood Xylitol.